In this second of a four-part special series, one of UConn Today’s journalists reports on the experiences of a recent UConn graduate whom she met when she traveled to South Africa this past summer. Puerto Rico native Aileen Leask ’12 (CLAS), with her petite stature, sunny personality, and luminous smile, may at first glance seem out of her element in the dangerous and unforgiving habitat of the South African bush. Yet she now lives at Entabeni Game Reserve in South Africa, where she is undergoing training to become a licensed nature guide. Enrolling this past July in an intensive, hands-on, six-month course at the reserve, Leask has been doing everything from tracking lions on foot and learning how to handle a rifle to getting firsthand experience in wilderness survival. 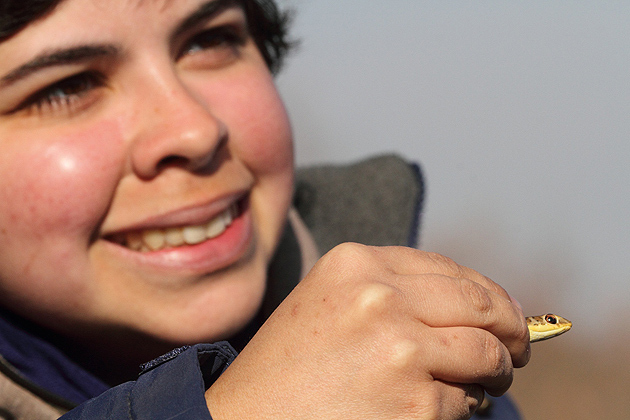 Arriving at UConn five years ago, Leask, then 18, knew that she wanted to work with wildlife. She held fond memories of childhood field trips with her school back home – hiking in the rainforest of Puerto Rico and taking daylong outings to the small, uninhabited islands off its coast, rich with wildlife. In her freshman year, she was recruited to live in UConn’s Global House Learning Community by a professor who was serving as director. That professor was Morty Ortega, an associate professor in the College of Agriculture and Natural Resources.